Too Hot? Too Spicy? Hot Hot! Chillies come in so many different forms and can be used in a multitude of ways. The ones that are in constant rotation in my kitchen are fresh red and green chillies, dried chillies, Kashmiri chilli powder, the Malaysian sambal oelek, shichimi (Japanese 7 spice powder) Sriracha hot sauce (the Hollywood A-lister of the condiment world, created by Chinese-Vietnamese founder David Tran), a crispy chilli in chilli oil that has fried shallots in it and a photography of a very serious looking Chinese lady on the front and most recently gochujang, a fermented Korean condiment made from red chillies, glutinous rice, fermented soya beans and salt. It would seem I have the bulk of Asia covered! And they’re all fantastic in their own unique way. Oh, and those pickled green chillies you sometimes get on the side when you order falafel? Uhh yes please! Who could refuse that tangy, spicy kick in the tastebuds?! I do realise that not everyone’s such a huge fan though and people are often told to stay away from spicy foods when they’re feeling unwell. I don’t know about you, but sometimes when I am sick that’s what I find myself craving, especially when I have a cold or I’m feeling congested. At times like this I imagine something hot and fresh, like Tom yam soup, will cut through the sick feeling and come out triumphant! (or at least shoo it away a little faster.) It may not be the best thing to have if you have a stomach bug, but according to Wikipedia, the online fountain of knowledge, chillies are a safe and effective way in relieving arthritis pain, shingles, diabetic neuropathy and headaches. Not that I needed convincing, but anyways, I’m sold! 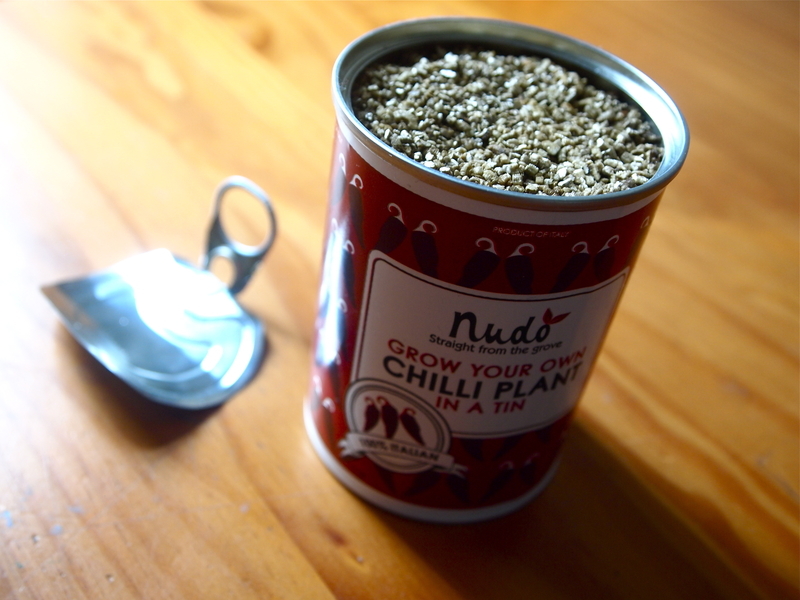 With the amount of chillies that I use in my cooking, I thought it was about time I grew my own. My sister Rachel bought me a nifty little grow your own tin, well, ages ago (sorry Rachie!) that I had yet to use, so yesterday I cracked it out to hopefully send myself on my way to chilli nirvana! Here look, isn’t it cute? I can’t wait to see all those little Italian chillies start to flourish! According to psychologist Paul Rozen, eating chillies is a prime example of a “constrained risk”, like riding a roller coaster, so people can enjoy the feelings of pain and fear because they know that these sensations are not actually harmful. This method lets people experience extreme feelings without any risk of bodily harm. That says it all: If eating chillies is being compared to riding roller coasters, they must be pretty damn amazing. * And no, I am not ACTUALLY entering Martina into a chilli eating contest. The idea is to help increase tolerance, not annihilate her poor little tastebuds!